This system features high performance dielectric, conductivity, electrochemical, impedance and gain phase measurements in the frequency domain. It is our latest, most powerful and flexible system and recommend for new instrument designs. The system is modular and based on an Alpha-A mainframe unit which usually is combined with one or more test interfaces optimized for special functionality. All test interfaces for impedance measurement offer in addition high general purpose performance like highest accuracy and ultra wide impedance and frequency range. This makes the Alpha-A system an unique and easy to use instrument with exceptional overall performance which suits in addition many special requirements like e.g. 4 electrode high impedance, high voltage, high current measurements and potentiostat, galvanostat functions for electrochemical impedance spectroscopy EIS. 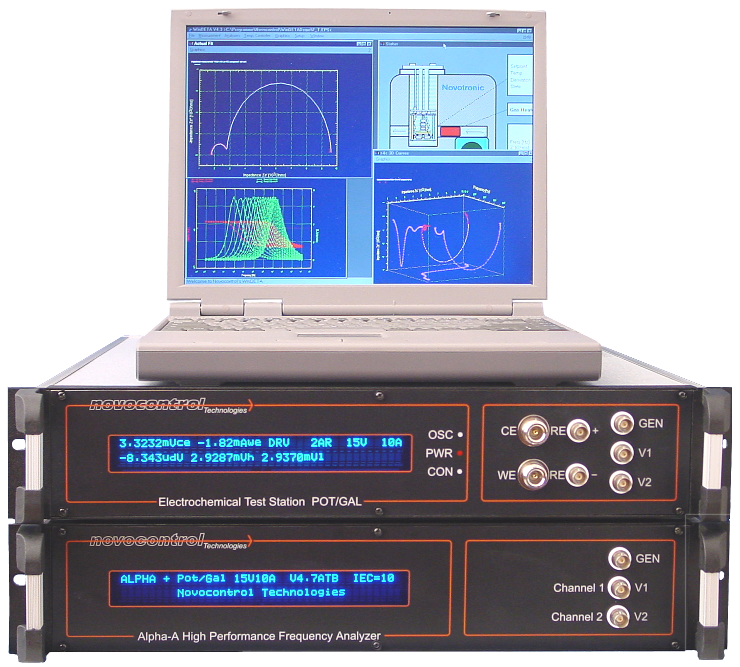 The Alpha-A family covers 18 orders of magnitude impedance range (16 orders for each impedance test interface), 12.5 orders of magnitude frequency range and 2m° basic phase accuracy. This combination makes the Alpha-A system a powerful tool which sets the pace for electric frequency domain analysis instrumentation. As a result, permittivity, conductivity and impedance of nearly all materials or components including special functions can be measured broadband and over a wide temperature range without changing sample geometry or sample cells. A sub range of the Alpha-A system functionality is also available by the Alpha and Beta single unit analyzers which are predecessors of the Alpha-A series and are still available as an economical alternative. A more detailed comparison of the three Analyzer series can be found here. Broad frequency range 3.10-5 .. 4.107 Hz including low frequencies for characterization of dielectric relaxations, electrochemical and high impedance effects. Ultra wide impedance range 10-3 .. 1015 Ω (18 decades) covers range from conductors to best isolators. High phase 2.10-3 ° and loss factor tan(δ) absolute accuracy 3.10-5 for low loss dielectric materials and isolators broadband characterization. Supports a series of test interfaces for customized applications with special functionality. Supports non linear Dielectric, Conductivity and Impedance Spectroscopy or gain phase measurements in combination with all test interfaces. Supports high speed measurements rates up to 157 impedance or 210 gain phase measurement points per second via the GPIB port for online monitoring of time variant processes in the 5 ms range by mainframe option F.
New test interface concept with adaptive system functionality and single port operation by high level GPIB commands for easy and straightforward implementation in own programs or existing measurement set-ups. 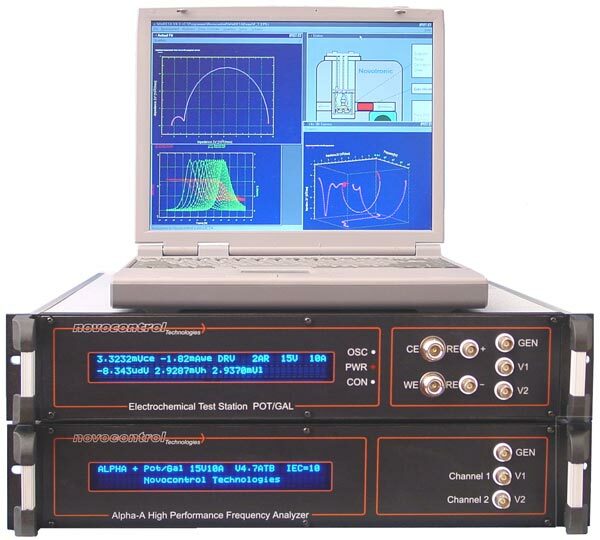 Precision digital frequency response analyzer up to 40 MHz for two channel gain phase measurements with 0.001° phase - and 10-5 in amplitude resolution included. Operates like a broadband lock-in amplifier with two channels, extended accuracy and frequency range. Optional control WinDETA software for turnkey calibration, operation, data evaluation, 2- and 3- dimensional graphical representation including non linear spectroscopy.